And with the final episode of the six-part #TrueGritTuesdays series, we come full circle. Sort of. We started with the younger sibling of a former champion, and we end the same way, although with a different pair of siblings. It takes a family to raise a free throw shooter. 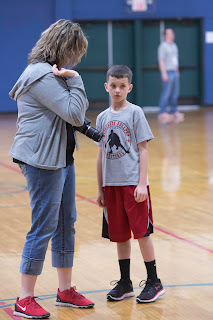 Here, Alex gets pointers from his mother, Terri, during a practice session at the Springfield Boys and Girls Club. The entire series has been about grit and how the Hoop Shoot program develops it. As a participant who recently aged out of the program, Taylor is uniquely qualified--at least among the people we interviewed; compare with Phil Abrams, who aged out during the Reagan presidency--to reflect on the lessons of the Hoop Shoot. So, what did she learn? "I've learned that it takes a lot of hard work and dedication to go every day to practice so you can succeed," Taylor says, "or at least have a good chance to do well in the competition." That last part there is so important. Practice and hard work won't guarantee success, but they sure will give you a better shot. Understanding that distinction can be the difference between a person with grit and a person who quits. In her very next sentence, Taylor takes the lesson she learned and applies it to everything else. Literally. "It helps you in school," she says, "where you have to work hard to get good grades, and, pretty much, in all of life." And there you have it, from no less an authority than a two-time national champion. Her parents also had a lot to say. This year's trip was their fourth to Nationals--Taylor finished second in 2010, foretelling those two championships--so they're more than qualified to weigh in. "You learn so much from the Elks contest," says mom Terri. "You learn how to set goals and work hard." "He learns what dedication and hard work can do for you when he sees himself improving and doing things he didn't know he could do," says dad Dave of Alex. When they see themselves getting better, explains Terri, they connect their improvement to their hard work and that makes it all worth it. "That transfers to everything that the kids try to do." I don't want to spoil the ending, but Taylor is still playing basketball. As a freshman last year, she cracked the starting lineup for the varsity squad. But I want to be clear here: Participation in the Hoop Shoot may help kids become better basketball players, or at least better free throw shooters, but that isn't the point. Recently I was talking with an Elk who volunteers with another one of our programs about the importance of outcomes, and he asked how many Hoop Shooters have gone on to the NBA. That's not the point. That's not what we're doing here. Take the point from Terri Robertson. "We appreciate everything the Elks have done for us," she says. "They have given our kids some wonderful memories and helped them develop into better, better people." We're not developing better basketball players. We're developing strong, mentally tough kids who can face life's challenges head on and win. In case you haven't seen it yet, here's My Sister's Footsteps.